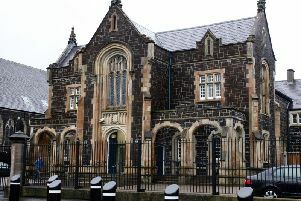 A Royal Marine has appeared in court charged with Northern Ireland-linked terror offences. Ciaran Maxwell, 30, of Exminster, Devon,, but originally from Larne, is accused of stashing explosives and weapons in purpose-built caches in England and Northern Ireland. He also allegedly compiled a library of terrorism documents, including instructions on how to make explosives and tactics used by terrorist organisations. Maxwell, who wore a grey tracksuit for the hearing at Westminster Magistrates’ Court in London, is also charged with possessing articles in connection with use for fraud and possessing cannabis with intent to supply. Flanked by four plain-clothed officers in the dock, he pleaded not guilty to both charges, which will be tried in conjunction with the alleged terror offences at Crown Court. Maxwell was arrested on August 24 by officers from the Metropolitan Police Service’s counter-terrorism command, supported by Avon and Somerset and Devon and Cornwall Police. It is alleged that between January 1 2011 and August 24 2016, Maxwell manufactured explosive substances and constructed explosive devices. He is accused of carrying out research resulting in the creation of a library of documents likely to be useful to someone committing or preparing an act of terrorism - specifically information regarding “the manufacture of explosive substances, the construction of explosive devices and tactics used by terrorist organisations”. Maxwell is also charged with getting an image of an adapted PSNI pass card and items of PSNI uniform. He was remanded in custody and will appear at the Old Bailey on September 19.